William Gordon Harrison was born December 30, 1952 to William Jesse Harrison and Patricia Ann (Dillard) Harrison in Pueblo, Colorado. He was joined by sisters, Deborah (Jerry Gentry) and Pamela (Stephen Houser). He committed his life to Jesus in 1960. He married Cheryl (Schultz Krug) in 1976. Their children are Eric J. (& Debbie Arnet Sunde) Harrison, Sugar Hill, Georgia, CH (MAJ) William I. (& Rachel Liebsch) Harrison, Ft. Wainwright, Alaska and Dustin L. (Margaret Wurzer) Harrison, Denver, Colorado. A teenage foster daughter, Jennifer (nee Wons-Glover (Greg Walker)), joined the family in the late 1980’s. Bill loved and enjoyed his grand-children Gabriella, Mikayla, and William (children of William & Rachel) and Jennifer and Greg’s children Jackson, Archie, Lucy, and Lane. Bill entered his heavenly home July 9, 2017. He was preceded in death by both his parents. “Billy” began elementary school in Englewood, Colorado and Junior High in Northglenn, Colorado but graduated Senior High from Douglas County High School, Castle Rock, Colorado. As a student, he played football (#75), developed a passion for the sciences, played piano (Für Elise) and attained the 4-H W.H. Danforth I-Dare-You Award. He went on to attend Colorado School of Mines. While at the School of Mines, he was active in the Search & Rescue unit and ROTC. During his 43-year career, he worked for Natkin Construction, Stearns-Roger, Stone & Webster, Raytheon, CH2M Hill, Washington Group International, URS, and Jacobs Engineering Group. His design capabilities were sought after for many civil, power, and mining projects in many parts of the world as well as Colorado. To his family, Bill was giving, forgiving, reliable, near, involved, and caring. We knew we were loved. His Lord loved him with salvation, blessing, and His in-dwelling Spirit. Bill bore out His fruits of love, joy, peace, longsuffering, gentleness, goodness, faith, humbleness, and sobriety; we knew Bill by them. His friends looked forward to his company and he anticipated every get together with happiness. The Church family at Columbine Baptist was near and dear to Bill’s heart. He loved Family Night, Resurrection Sunday pancake making, and his brothers and sisters in Christ. You are his family too. Every club or activity that Bill joined was fundamentally about relationships with the people he met there. No matter what he was involved in or how you knew Bill, that he got along with you was more important to him than any other thing that got settled. Bill was enthusiastic about various hobbies. Early on he added CB radio (Lucky Miner) and 4-wheeling to his love of Search & Rescue. During high school, he became a “rockhound” and within a short while had involved his entire family in the Gates Rock and Mineral Club. He loved Colorado’s outdoors and field collecting was a passion. He served as Gate’s club field trip leader for many years. One rock club wasn’t enough and he joined Mile-High RAMs. During the 1980’s he changed his club affiliations to North Jeffco Gem and Mineral Club and Colorado Mineral Society. He remained a member of both until his death. He also took an active part in the Greater Denver Area Rock and Mineral Show (and its precursor), serving as Show Chairman a couple of times. 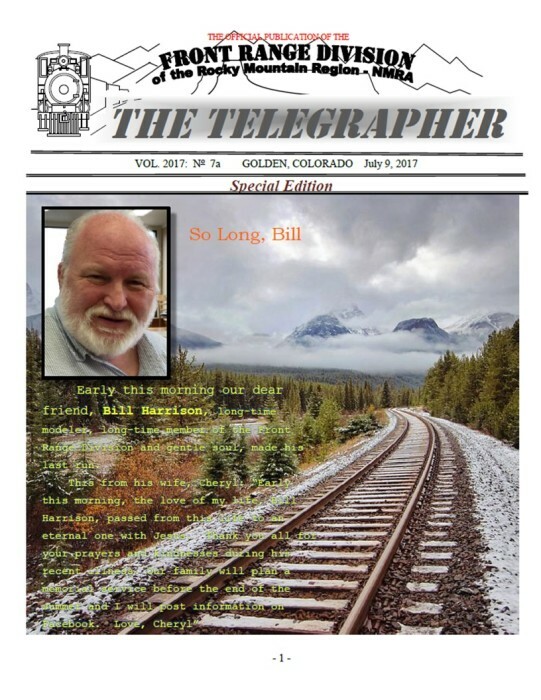 Bill enjoyed spending time with other mineral lovers and during retirement he volunteered weekly at Colorado School of Mines Museum. Railroading was always dear to Bill but vision problems prevented him from following down his father’s and grand-fathers’ tracks. Despite this disappointment, he cultivated a deep knowledge of Colorado railroading and Colorado history. An on-going N-Scale model railroad in the basement gave him a creative outlet following his first health crisis. He became known as a skilled model builder and loved the contributions he made to the N-Scale lay-out at the Forney Transportation Museum. He always looked forward to spending time with “the guys” at the lay-out, or home tours, or train shows. Bill’s mother, Pat had a passion for genealogy which settled well with Bill’s love of family and history. He used her research and records to make wall art for his ‘man cave’ with anecdotes and mementos of loved ones. Bill served as an Assistant Scout Master of BSA Tr. 459 (Columbine United Church) during Eric’s scouting years; as Cub Scout Master of Pack 63 (Coronado Elementary) and as a Scout Master of Tr. 63 (St. Gregory Episcopal) while Will and Dustin were scouting age. During those years, he served as a Nature Camp Leader, Leadership Trainer, and Camping Coordinator at various times. He got to see a number of Eagles take flight. He visited many homes for many years as “Santa”. And he loved the Broncos. His family and his friends from all these activities will sorely miss him.